Where did you come from? Create an image showing your family origins, ethnic heritage, etc. October 15, 2012. 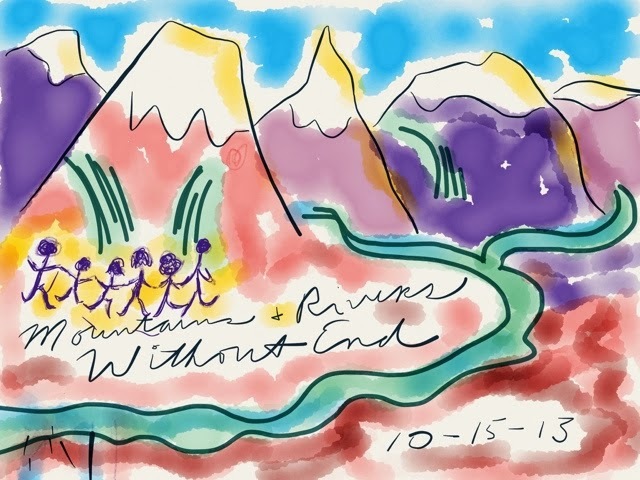 I chose a Gary Snyder quote to accompany the image I made using the Paper 53 app for iPad: “Mountains and rivers without end ” to represent all of the Washington/Oregon Cascadia where our family comes from. Previous PostInternet FlowNext Post“Painting en Plein Air”: Let the Poetry Begin! Completely charming, it looks like you used watercolor markers to make this adorable picture. Rivers and mountains without end, also deserts and oceans, lakes and swamps. You name it, without end. This would look cool on a Tshirt or a bag.